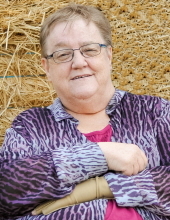 On Thursday, April 11, 2019 Paulette Pawliuk of Marsden, SK passed away in the Lloydminster Hospital at the age of 64 years. Paulette will be deeply missed by her Loving Husband of 43 years Philip Pawliuk of Marsden, SK; Children Marlo Pawliuk of Sheho, SK, Adrian (Rachel) Pawliuk of Chauvin, AB, Melodie Pawliuk of Tullby Lake, AB; Grandchildren Olena and Keira Pawliuk, Hailey, Colton and Dustin Brind; Sisters Louise of Swift Current, SK, Irene of Regina, SK; Brothers Ricky of Hardisty, AB, Roger of Regina, SK, and Dennis of Red Deer, AB; Mother-in-law Olena (Helen) Pawliuk of Foam Lake, SK; Sister-in-law Patricia (John) of Theodore, SK; Brothers-in-law Perry (Linda) of Winsor, ONT, Alex of Sheho, SK, Ivan of Sheho, SK; as well as numerous nieces and nephews. Paulette was predeceased by her Parents Joseph and Agnes Walters; Niece Renee; Nephew Adam; and Father-in-law Morris Pawliuk. In keeping with Paulette’s wishes cremation has taken place and no formal service will be held. If so desired donations in memory of Paulette may be made to the Kinsmen Foundation Inc. ( www.kincanada.ca), or charity of donor’s choice. "Email Address" would like to share the life celebration of Paulette Marie Pawliuk. Click on the "link" to go to share a favorite memory or leave a condolence message for the family.